Baby Collards & Broccoli with Pasta is satisfying reward after a day of yard work. No bumper harvest of collards for us this year. Squirrels kept digging up our collard plants, roots and all, to get at nuts they had buried in the garden last October. As a result of their diligent digging, we had several pickings of baby collard leaves, but only one decent picking of full size collard leaves. Since baby collards are tender you can easily incorporate the small leaves into salads and stir-fry dishes. 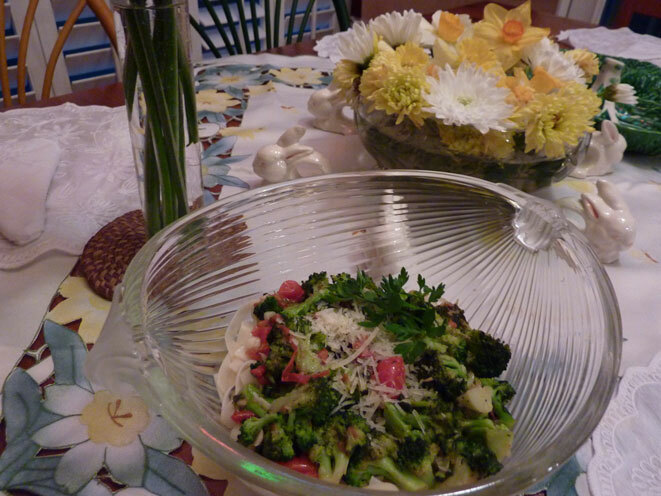 One of my favorite ways to use the small leaves is to toss them with fresh parsley, broccoli florets, a handful of chopped tomatoes, minced garlic, green onions, olive oil and salt, pepper and dash of Italian seasoning to make a topping for fettuccine or spaghetti noodles. If you have a bit of cabbage, cauliflower, spinach, sliced olives, etc., you can add these ingredients to the sauté as well. A sprinkle of freshly grated Parmesan cheese provides a bite to the dish’s taste profile. This is so easy – a perfect recipe for a quick-fix dinner on Saturday or Sunday after a day of working in the yard. 2. While pasta is cooking, pour olive oil in sauté pan. Heat over medium heat for 1 minute until just starting to warm. 3. Add broccoli florets, tomatoes, parsley, collards, garlic, and green onions to warm oil in skillet. Stir to fully coat the vegetables with olive oil. 4. Sprinkle coated vegetables with seasonings of choice. Stir and cook over medium heat until vegetables are cooked through and starting to caramelize on edges. Add teaspoon of butter (or slightly more butter, if you like a creamier pasta sauce). Stir the butter through the vegetables. 5. Remove sautéed vegetables and toss with cooked pasta, which has been drained and placed in a bowl. Top with freshly grated Parmesan. Serve. Testing note: I enjoy serving the vegetables over cooked Fresina’s handmade all natural fettuccine noodles made by D’Agostino Italian Specialties of Baton Rouge. The D’Agostino family’s pasta tastes like homemade because it practically is. They make their pasta in small batches from recipes used since 1926. The pasta can be ordered online at fresinas.com.